Over the past two months, I have had an opportunity to get to know and become friends with a local potter. She worked for years in a variety of corporate jobs, but never lost her love for or desire to create pottery. She finally made her dream come true in February 2012, when she opened a pottery studio and small consignment shop for local artists. I live in the middle third of North Carolina. This area is home to an extensive network of potters. The area around Seagrove is a pottery lover’s dream. You can spend days visiting all the studios and galleries, meeting potters and shopping. The artistry displayed by some of these craftspeople is breathtaking. My new friend clearly has the gift. A lump of unremarkable looking stuff — this grayish, moist mixture of clay and sand — can become anything in the hands of a master. 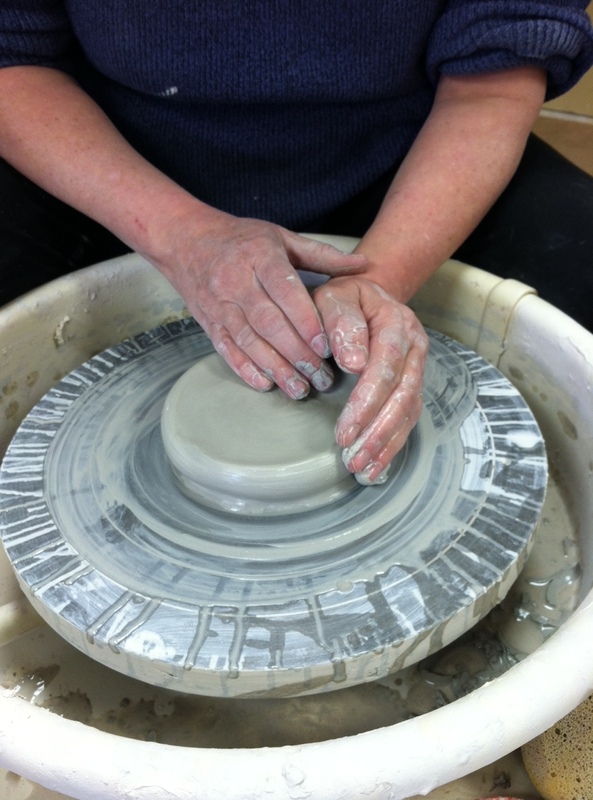 I watched as my friend sat on a small stool, grabbed a clump of clay out of a bag and placed it on her wheel. She used her right foot to start the wheel spinning. She wet her hands and carefully placed them around the clay. A little pressure in just the right place and the lump begins to become something. I wondered what she had in mind, but I didn’t ask. I wanted to see it come into being as a surprise – like awaiting the birth of a new baby without knowing in advance if it’s a boy or girl. In what seemed like only seconds, the shape of some type of column became visible. Finally she told me it would be a stand for a larger plate that had already been made. But with pottery, the making of the actual item is just part of the process. What I have not seen is the detail work she may have added. I haven’t seen the glaze colors she chose. I am so looking forward to going back to the shop to see the final product. It’s no wonder that our lives, shaped and colored by so many inner and outer forces, are often compared to clay in the hands of the Master. No matter how we hard we work to mold our future, the truth is that our future can be reshaped at any moment. Fortunately, thankfully, the beginning is never the end. It’s a promise of more to come. Today’s Weekly Photo Challenge invited us to grab an image from our world that holds the promise or portent of the future. For some of my friend’s creations, visit pinterest.com/jamestownps .